Tiger Technology and FilmPartners Deliver a Scalable and Universal Production Workflow for Avid, Apple and Adobe: "Editors can now collaborate on universal MXF-based projects and edit-in-place SD, HD and film content using their editing application of choice (Sofia, Bulgaria--March 24, 2011) Tiger Technology, a leading provider of high-performance, cross-platform SAN management software solutions and Netherlands-based FilmPartners of the international Euro Media Group announce a new strategic partnership for delivering a scalable and universal production workflow for Avid MediaComposer©, Apple Final Cut Pro©, Adobe Premiere Pro©." New digital cameras released over the last year have brought exciting changes to the world of cinematography and videography. From ARRI’s Alexa digital cinema camera to large sensor camcorders to the 60D, Canon’s new DSLR, filmmakers and broadcast camera operators have a growing choice for features, television and commercials. digital cinema and HD television, overcoming narrow colour gamut limitations. QuickTime shows 720 video as 1248x702. <div style="direction:rtl;text-align:right">אלרום משיקה לראשונה בישראל תוכנה להפקת כתוביות בתלת מימד</div>: "
התוכנה מציגה טכנולוגיה הנחשבת לחידוש בעולם ככלל ובישראל בפרט. עד כה לא נכנסה לשימוש תוכנה להפקה ועריכה של כתוביות בתלת מימד. Edit Suite Design 2011: "It’s time to revisit an old subject for a new year – configuring a post production suite. Poke through these past articles and you’ll get plenty of ideas about how to build the room and what to put in it. Another great source for inspiration is just to scan through the “Rig of the Day” [...] "
Editing HDSLR footage natively: "With the wild success of HDSLR cameras from both Canon and Nikon, there is a renewed interest in editing H.264 media natively, using the video files that are transferred directly from the camera into your editing system. H.264 is the video format that these cameras use for capturing their images. Editing natively saves time because you don’t need to transcode your video. And H.264 files are very small, compared to other video file formats. " ICC profile cube from 3D LUT: Alexa EI350: "
Steve Shaw at www.lightillusion.com has shown us a way of baking into stand alone QuickTime movies (this includes Alexa captured 4444 ProRes) a 3D LUT that is converted into an ICC Profile. 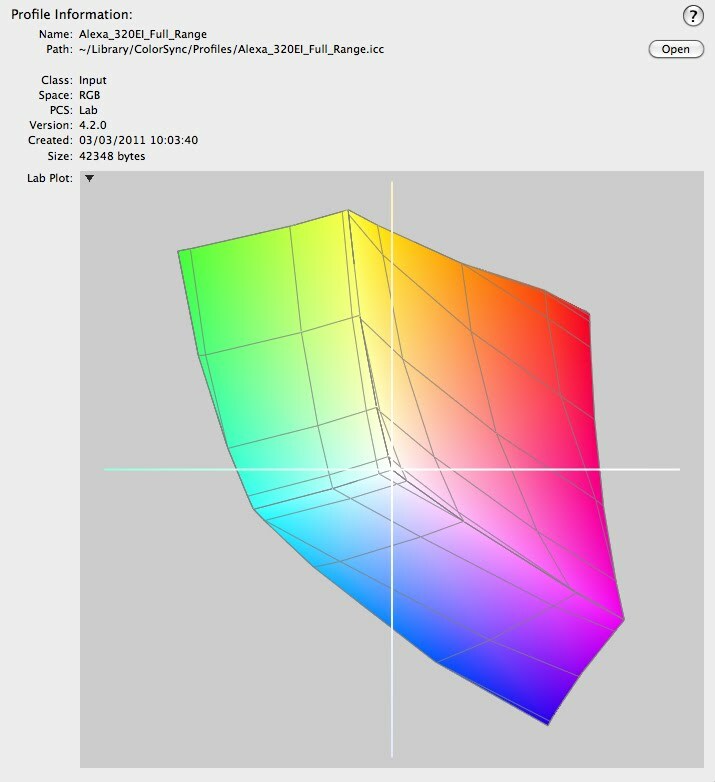 By doing this we can use Colorsync within Mac OS to apply the converted 3D LUT and burn it into the .mov file. To do this you do require Intel Mac and QT Pro7 and also the software, called Spaceman, which will do the 3D LUT conversion for you. Once you have converted the LUT into the ICC profile you then load this profile through QT Pro7 and Colorsync and there you will have the burnt in correction for your offline and dailies. Attached here is an ICC profile for an Alexa EI350 LUT, this 3D LUT has ben converted to an ICC profile and here is the information as a 3D cube. Thunderbolt Technology in Action: "A couple of weeks ago Intel introduced a new technology for I/O use and data back ups. If you missed that information you can read all about it here. Over the past few weeks there has been a lot of buzz regarding this new technology. Thunderbolt’s ability to transfer data at 10Gbs a sec while [...]"